Many scientists spend a lot of time criticizing the public and policy makers for their flawed understanding of science. Such criticized invariably implicates the media for not properly educating the public and giving voice to certain undesired voices. But what if such views that scientists hold about the public, policy makers and the media are themselves flawed? And even more importantly, what if the actions that scientists take justified by these views actually exacerbate the politicization of science and diminish its role in decision making? 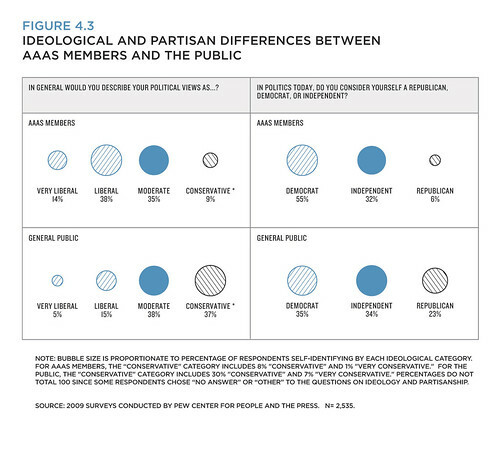 the AAAS sample, moderates and conservatives among their ranks may feel reluctant to express political views, policy proposals or preferred public engagement approaches that are perceived as different from the preferences of their liberal counterparts. Such pressure exhibits itself in less direct ways as well. With an ever-increasing reliance on blogs, Facebook and personalized news, the tendency among scientists to consume, discuss and refer to self-confirming information sources is only likely to intensify, as will in turn the criticism directed at those who dissent from conventional views on policy or public engagement strategy. Moreover, if perceptions of bias and political identity do indeed strongly influence the participation of scientists in communication outreach via blogs, the media or public forums, there is the likelihood that the most visible scientists across these contexts are also likely to be among the most partisan and ideological. There is ample anecdotal evidence for such assertions, but it would be great to see some systematic studies. In particular, certainly worthy of further study is the way in which scientists and members of the public establish informal collaborations via social media such as blogs to intimidate or make uncomfortable those who would express challenging views. 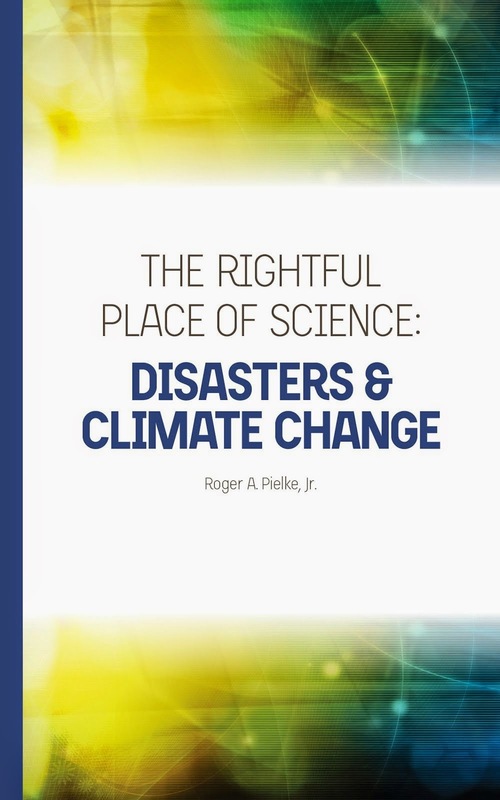 As is the case with respect to the public, the media and the political process most attention has been paid on how these groups affect the work of scientists (e.g., the entire issue of "scientific integrity" is about outside interference in the work of government scientists), which is certainly a very important topic. By contrast, very little scholarly attention (that I am aware of) has been focused on how scientists engage with the public, the media and the political process in an effort to enforce within the scientific community a particular political agenda (or a view of science perceived to be consistent with that agenda). When it comes to policy debates, scientists recognize that they have a role to play in supporting public debate but emphasize a need to educate the public so that non-experts will make policy choices in line with the preferences of scientists. decision-making while having reservations about the public’s capacity to do so. One study spoke of a scientist’s need to have the public provide “legitimacy and validation” (Young and Matthews, 2007: 140). This position appeared to be operationalized as a duty to empower citizens to make good decisions. However, a good decision was understood as one that was consistent with scientists’ point of view, and empowerment was understood as education (Davies, 2008). In the end, scientists report feeling frustrated when they believe their views receive inadequate attention (Gamble and Kassardjian, 2008; Stilgoe, 2007). As I have long argued, the best way for the scientific community to deal with the tide of politicization that it has been caught up in is not to try to remove itself from political debates, but rather to become more closely engaged -- but to do so intelligently. Understanding options for such intelligent engagement is the central challenge discussed in The Honest Broker.